The U.S. Department of Defense is considering offering rapid seed funding to private companies as a way to encourage more work on technology projects with the commercial sector, Secretary of Defense Ashton Carter said Wednesday. The push for greater cooperation with tech companies has been a big theme for the DOD in the last year as it faces a growing and unprecedented threat from private and state actors on the Internet and beyond. That was demonstrated late last year when Sony Pictures suffered a devastating hack of its corporate email system that the U.S. government attributed to North Korea. Hackers based overseas have also been blamed for high-profile attacks on the Department of State and the Office of Personnel Management, the latter of which resulted in personal data on millions of government employees being lost. "The DOD has to tap into all the streams of innovation and emerging technology and it has to do so much more quickly," Carter told DARPA's Wait, What? conference that is taking place here in St. Louis, Missouri. "That’s why I’ve made building and rebuilding the bridges between (government and the private sector) one of my core goals as Secretary of Defense, because going forward we need the best people, the best tech and the best innovation to remain the world’s finest fighting force." 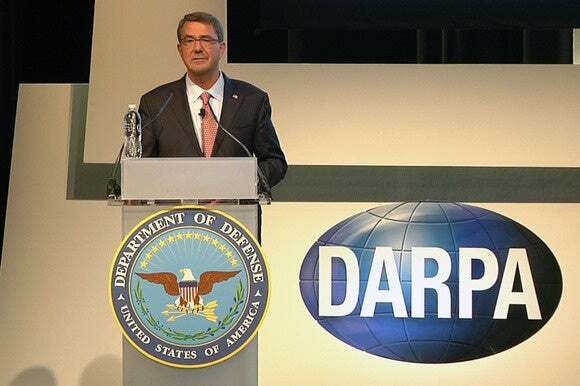 U.S. Secretary of Defense Ashton Carter speaks at the DARPA Wait, What? conference in St. Louis, Missouri, on Sept. 9, 2015. Carter, who himself is a physicist, highlighted the changes he has seen over his career and the increasing role that the private sector, particularly that of Silicon Valley, plays in technology development today. "Nations like Russia and China are modernizing their militaries to try and close the gap and erode our superiority in every domain: air, land, sea, space and cyberspace," he said. "And at the same time our reliance on satellites and the Internet has led to real vulnerabilities that out adversaries are eager to exploit. So to stay ahead of those challenges and stay the best, we’re investing aggressively in innovation." Many at the DARPA conference don't need convincing. They are already working with the agency or interested in doing so. When Carter took the stage, many in the audience stood up, cheering and clapping his entrance. But that response hasn't been universal. In February, President Obama convened a cyber security summit at Stanford University to call on business and tech leaders to work more closely with the government to identify security weaknesses and combat cyber crime. Missing from the meeting were the CEOs from Google, Yahoo and Facebook, who all turned down invitations to attend from the president. Many of Silicon Valley's big tech companies remain reluctant to work closely with the government -- at least publicly -- in the wake of the revelations by Edward Snowden about government-sanctioned hacking and surveillance. But some seem open to the idea. Apple signaled its willingness to work with the government when Tim Cook spoke at the Stanford event, and the company is one of a handful that just announced participation in the DOD's Flexible Hybrid Electronic Institute in Silicon Valley.